…It’s off to Zambia we go. Again. The second season of the ‘Deep Roots’ archaeological project starts in a few days with a new team of students from the UK and Zambia along with specialist support arriving later on. We’ll be back at the World Heritage site of Victoria Falls building on last year’s work* and plugging big gaps in our knowledge – we hope. But first, a quick update on where we are and what we’ve been doing back in the labs. Much of the 2017 season was spent looking for sites recorded by Desmond Clark in the 1940s and earlier. We have his maps but those were the days before GPS and there just wasn’t enough detail to re-locate most of the key sites. By way of a recap, we’re looking for sites that preserve stone artefacts from a time period roughly 600,000 to 200,000 years ago. Over this period our species, Homo sapiens, evolved, but there were at least two other human ancestors in the region that we know of, Homo naledi and Homo heidelbergensis. So we can’t be sure who made the tools we’re finding and it’s the tools we’re interested in, because they document a basic change in the way humans thought about technology. For the first time tools started to be made by combining parts to make a whole new tool. Before then all tools were made by removing pieces of stone from a block, and as far as we know this reductive approach also applied to making tools of wood and bone. The new technology made it easier to cut, scrape, drill or pierce – just about every basic task was made easier with the addition of a handle or shaft. That’s the essence of ‘combinatorial’ technology and it’s a principle underlying everything we make today. There’s a whole book on this if you want to get into the detail**, but let’s move quickly back to Zambia because that’s where we’re looking for evidence of when and how this change happened. Desmond Clark found sites around Victoria Falls with large hand-held tools of the Acheulean (Early Stone Age) with smaller tools (Middle Stone Age) in overlying sands. The Middle Stone Age tool kit includes what may have been the stone inserts in handles or shafts, but those organic parts have long since decayed leaving only the small stone bits behind. Our job is to find out how long ago this transition took place in what is now Zambia and then link the evidence here to the wider African and global archaeological records. Dating specialists will be analysing the sands (I’ll explain the techniques another time), and the archaeologists will be examining the tools closely to identify any traces of how they were used, including evidence of being part of larger combined or hafted tools. There’s also the question of why this transition took place when it did, and new research published this year from East Africa points the finger at climate change (see Potts et al. 2018). It may be a coincidence, but the invention of hafted tools came along when the Earth’s climate shifted gear into longer, more extreme and more unpredictable glacial cycles. It’s a time of extinction with sweeping changes in animal species in East Africa and the emergence of the modern African fauna we know today. And it seems we humans responded by making more lightweight, efficient tools and building more extended social networks. We’ll be looking for any evidence of environmental change as we excavate but, to be honest, the sands around Victoria Falls aren’t the best sites for preserving the kind of detail we’d like. For a start, bone rarely survives. Clark recovered fragments of a molar from an extinct elephant in gravels near the Falls, but the site is difficult to find today as the area has been built over. We’ll have a good look, though. At the end of last season we shipped the artefacts back to Liverpool where we’ve been examining them to find out what they were made of, where the makers got the stone from and how they made the tools. Pascale showing the effectiveness of the magnifying light in the lithics lab. There’s still much work to do. We also made a brief recording of the lab work for use by the Zambia National Broadcasting Corporation in their documentary on the Deep Roots project. Expert ‘primitive’ technologist, Karl Lee, visited the lab and looked at the artefacts in advance of his joining us in field. Karl will be replicating the tools we’ve found using local materials from around the Falls and then using the tools to cut, scrape, chop and pierce. He’ll even try hafting some tools onto handles made from local woods and using local tree-based adhesives and strips of binding materials. Colleagues from the Livingstone Museum are gathering information on indigenous plant use in advance of Karl’s arrival. All this effort will go towards building a reference collection for the microscopic analysis of the traces of use on the actual artefacts. And we really need to know what they were used for if we are to understand the process of technological change way back when. The sands collected for dating are at Aberystwyth University in Wales where Prof Geoff Duller and his team are analysing them to give us a general idea of the time range we’re working with, and I hope he’ll have some results for us when he comes out later in July. New to the project this year is Dr Sumiko Tsukamoto from the Leibniz Institute for Applied Geophysics, Germany who will bring her PhD student Marcus Richter. Sumiko and I worked together at Kalambo Falls several years ago. They will be collecting sand samples for dating using a different technique from Geoff’s which should give us a way of cross-checking the two sets of results. Dr Andy Hein, University of Edinburgh, Scotland will be applying yet another dating technique, but to rocks not sand. He’ll be breaking pieces from the edge of the gorges below Victoria Falls to date when the gorges were first exposed to cosmic rays by the erosive power of the Zambezi. 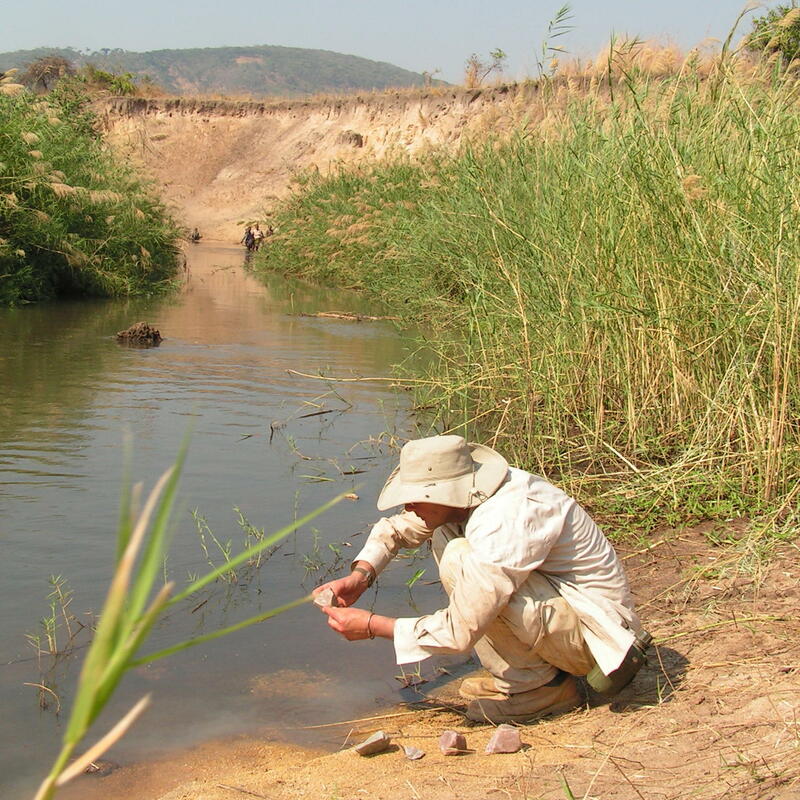 Maybe, just maybe, we’ll get a date for when the gorges formed and the old gravels of the Zambezi, with their Acheulean tools, were left high and dry. All this and more is about to begin so join us for the Deep Roots adventure 2018. **From Hand to Handle: The First Industrial Revolution, L Barham 2013, Oxford University Press. Potts, R. et al. 2018. ‘Environmental dynamics during the onset of the Middle Stone Age in eastern Africa’. Science 15 March. Liverpool Team update: Currently sat in Dubai airport discussing Hand to Handle and why badgers dig square latrines. See you in 13 hours. Liverpool Team update: Currently in Dubai discussing Hand to Handle and why badgers dig square latrines. See you in 13 hours! Good news on the permit, came through yesterday. But, ha another but, the promise of a scout to take us into the field today wasn’t communicated down the ranks to the Senior Ranger in charge of allocating field staff. Tomorrow, we’re told, everything will be in place. I’m an optimist, still. My name is Larry (Lawrence if I’m feeling formal) Barham and I'm a Professor of African Archaeology at the University of Liverpool, England, teaching evolutionary anthropology at undergraduate and postgraduate level.